While Pumpkin Pie is a given for your Thanksgiving dessert spread, you may wrestle with indecision as you try to determine the other pie varieties. 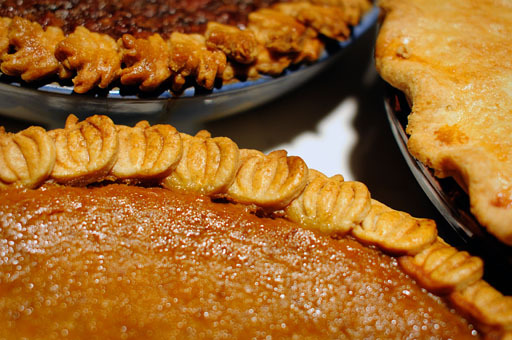 Some swear by apple, others pecan, but we decided to share Food & Wine's Top Ten All-Time Favorite Pies, to add some other less well-known favorites into the decision mix this year. Georgia Peach Pie - Flaky crust, sweet peach filling, what's not to love?! Finding good peaches in Minnesota right now, perhaps? Coconut Custard Meringue Pie - Cool, creamy coconut custard topped with heavenly clouds of meringue? Yes, please! Deep Dish Strawberry Rhubarb Pie - A perfectly Midwestern treat. If your Rhubarb is done for the year (or covered with snow, look, for it at your favorite specialty grocery store (or even try to sub in some frozen rhubarb). Dulce de Leche Ice Cream Pie - A spiced graham cracker crust filled with perfectly sweet Dulce de Leche ice cream (try Häagen-Dazs®) and topped with your favorite sundae toppings. The kid in everyone will be screaming for ice cream. Chocolate Cream Pie - Sandwich a rich velvety chocolate pudding filling with a dense chocolate crust and vanilla-flavored whipped cream and you have a smash hit on your hands, my friend. Yogurt & Apricot Pie with Crunchy Granola Crust - A sweet and tart pie that's good for both the tastebuds and the heart? Your health-conscious, sweet loving guests will be thanking you all the way until Christmas (when they ask you to make it again). Flaky Pear Pie - A beautiful, flaky (lard-based) double-crust pie with a lightly sweetened pear filling. Just a hint of spice will land this pie the spotlight in your Thanksgiving Day spread. Chilled Grapefruit Caramel Meringue Pie - This seemingly disastrous combination, with its layers of pink grapefruit curd over graham cracker crust, caramel sauce and delightful meringue is actually not good, it's simply delectable. If you're looking for a unique pie to add depth to your dessert table, you've found it in this one. Chocolate Pecan Pie - While traditional pecan pie is a staple around the holidays, the addition of dark chocolate creates a rich, fudgy texture and an irresistible treat is born. Lime Cream-Blackberry Pie - The delightfully tart combination of freshly made blackberry jam topped with a cool lime cream inside a sweet and buttery graham cracker crust is a solid complement to other pies and adds a hint of summer flavor to your autumnal feast. Happy baking, happy eating, Happy Thanksgiving to you and yours! We're getting quite excited for our bountiful Thanksgiving Day Champagne Brunch! All of the details may be found in our blog post, Thanksgiving Brunch, from last week. If you missed it, make sure you go back to take in the huge menu that includes all of your breakfast, lunch, and Thanksgiving favorites, hours, and pricing. We're also excited to announce that the Kenny G. Trio will be serenading our Thanksgiving Brunch guests with some lovely live music. If you can't make it to brunch, Woolley's will also be open for regular dinner service from 4:30 to 10pm on Thanksgiving. We'll be featuring some great Thanksgiving specials, as well as the full dinner menu. All bottles of wine and champagne will be 50% off the entire night! Reservations are recommended and can be made by visiting Open Table online or calling Woolley's at 952.854.1010. Last year, our Thanksgiving Day Brunch was such a hit, we decided to do it all over again! From 10:00am to 2:00pm on Thanksgiving Day, leave all of the cooking and cleaning to us and enjoy all of your breakfast, lunch, and Thanksgiving favorites at our Thanksgiving Day Champagne Brunch. Join us this Thanksgiving as we celebrate everything we have to be thankful for in a bountiful culinary display. Adults: $28.95, Kids 4-12: $14.95, Kids 3 & Under: Free. Reservations strongly recommended. To make your party's reservation, visit Open Table online or call Woolley's at 952.854.1010. The last post in our four-part series, Dining on a Dime, is dedicated to a group that not only helps people save their dining dollars, it also helps the community as well. Outstanding Dining, the brainchild of our very own Director of Restaurants, Ben Berry, is a website that sells online restaurant certificates at a discount. Yet, it doesn't stop there. Outstanding Dining also donates 10% of sales to different non-profit partners. Further setting themselves apart from other discount certificate sites, Outstanding Dining is committed to three main goals. First, they seek to save consumers money by offering a great deal on certificates to local, independent eateries. Second, they want to help non-profits through their commitment to donating 10% of sales to various non-profit partners. Third, they want independent eateries to thrive by splitting the remaining proceeds of the certificate sales 50/50. No price gouging and leaving the restaurants to foot the bill. At this time, you're able to purchase Woolley's Certificates as follows; a $25 certificate for $12.50 and a $50 certificate for $25.00. Check out Outstanding Dining this week for other amazing deals to great local restaurants, and make sure to look for them on Facebook as well. Through Friday, Outstanding Dining is taking entries on their Facebook page from fans who share a memorable dining experience. The comment with the most likes by Friday (November 4) at 12am wins the $100!